1 Trim radishes, rinse, pat dry and cut into thin slices. 2 Trim frisee, rinse, spin dry and divide into bite-sized pieces. 3 Peel the cucumber and cut into thin slices. Peel, halve and slice onion into thin rings. 4 Place sprouts in a sieve, rinse and drain well. 5 Drain pickled cucumbers and finely chop. Coarsley chop the cheese. 6 Mix vinegar and vegetable broth in a salad bowl. Season with salt and pepper and whisk in olive oil. 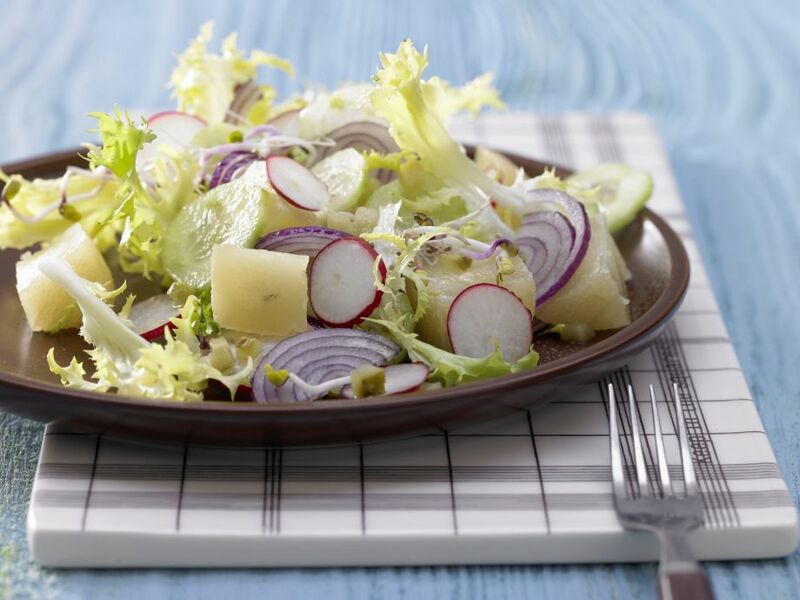 7 Stir in radishes, onion, fresh cucumber, pickled cucumber, cheese and sprouts. Marinate about 10 minutes. Season to taste with salt and pepper. Fold in frisee and serve. Super easy and simple to do, but I'm not a fan of the Sprouts. The radishes add a lot of flavor though.